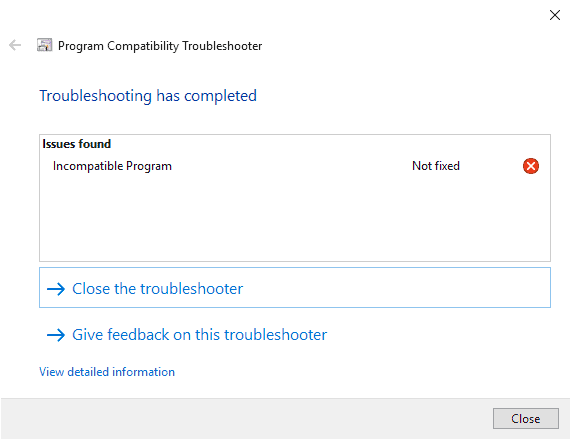 While this could have been an issue introduced in a recent Chrome or Windows update, I decided to run the Windows troubleshooter to see what it had to say -- if anything -- about the issue. Note: this message has nothing to do with Chrome's own incompatible applications warning. With Windows' troubleshooter being no help at all, I decided to try a couple of troubleshooting options. First thing I did was disable hardware acceleration as it caused quite a few issues in the past; turned out, it was not hardware acceleration that time. I found the cause for the issue but not the extension responsible. One issue with the outlined option is that you don't get access to the extensions interface in Chrome when you run it with the parameter. Recently, when I tried to start Google Chrome Canary on the system, I noticed that the browser would close automatically after a second or two. I have never had the Chrome problem you describe using its x64 beta version under Windows 10. However when I want to disable all extensions to troubleshoot some other problem not causing Chrome to shut down, I simply open a new Incognito window. No I did not, although ‘Use hardware acceleration when available’ does slow down the browser at startup. Now that you mention it, it happens every now and then with Brave beta Version 0.57.6. I’ve never had a problem with Chrome Stable crashing when started. Chrome Dev is a different story, the last time it was crashing at startup was just this summer. Fact is my experience with Chrome Dev is that it very often has bugs and those bugs can often be attributed to a flag being enabled, but then that same flag in Chrome Stable will be working just fine. This year, graphics related flags like zero copy rasterizer and out of process rasterization have been recurring problems for me on Win7 using a Nvidia graphics card. From what I’ve seen, on my hardware, disabling the GPU seems to me to be a more common solution than disabling extensions. If a flag is suspected to be causing a problem and you can’t open your chromium browser you can delete the “Local State” file in the “User Data” folder which will reset all of the flags. You can for example enter: %localappdata%\Google\Chrome Dev\User Data into the Windows Explorer address bar to get to that folder. You can also just use %localappdata% to open the AppData\Local folder and find whatever is needed inside there. I haven’t experienced any broken websites and none of my browser installs are using those ciphers. The command line switch also works in Vivaldi.